GREAT MILES 59,415! LTZ trim. WAS $31,995, $1,200 below NADA Retail!, FUEL EFFICIENT 20 MPG Hwy/14 MPG City! 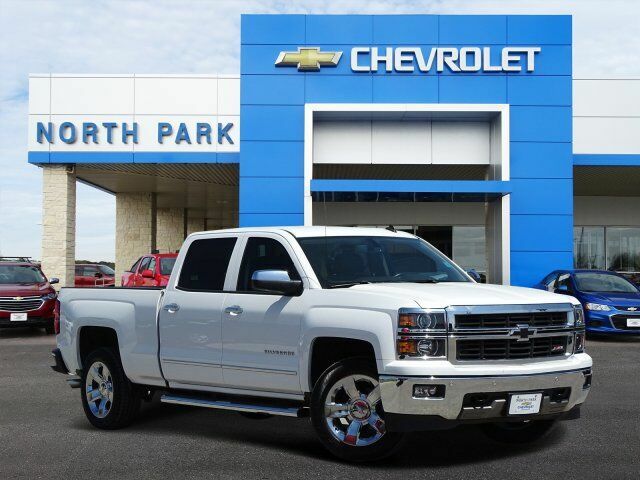 Nav System, Heated Leather Seats, Hitch, CD Player, Back-Up Camera, 4x4, CHEVROLET MYLINK AUDIO SYSTEM, 8" DIA... AND MORE! WHEELS, 20" X 9" (50.8 CM X 22.9 CM) CHROME, LTZ PLUS PACKAGE includes (JF4) power adjustable pedals, (UQA) Bose premium audio system, (UD5) Front and Rear Park Assist and (UVD) heated leather steering wheel, CHEVROLET MYLINK AUDIO SYSTEM, 8" DIAGONAL COLOR TOUCH NAVIGATION WITH AM/FM/SIRIUSXM/HD, USB PORTS auxiliary jack, SD card slot, Bluetooth streaming audio for music and most phones, hands-free Smartphone integration, Pandora Internet radio, voice-activated technology for radio and phone, and 4 customizable themes, ASSIST STEPS, CHROMED TUBULAR, 6" RECTANGULAR (factory installed), SEATS, FRONT 40/20/40 LEATHER-APPOINTED SPLIT-BENCH, 3-PASSENGER WITH (KA1) HEATED SEAT CUSHIONS AND SEAT BACKS includes 10-way power driver and front passenger seat adjusters, including driver/front passenger power recline, driver/front passenger power lumbar, 2-position driver memory and adjustable outboard head restraints. (STD), ENGINE Privacy Glass, Keyless Entry, Steering Wheel Controls, Heated Mirrors, Electronic Stability Control, Alarm, Electrochromic rearview mirror.